The decision to grant listed status to two of Huddersfield's most divisive buildings is a disaster for the town, a West Yorkshire MP has said. Queensgate Market Hall, which opened in 1970, and the 1930s Library and Art Gallery were both named as Grade II listed buildings on Thursday. Labour MP Barry Sheerman attacked the decision, claiming it would set back plans to regenerate the town centre. Kirklees Council had wanted to replace the now-protected buildings. 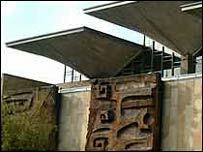 The 1970s Queensgate Market Hall features a "stunning roof structure" and is enhanced by abstract art on its east wall, the Departure for Culture, Media and Sport said. "It is an imaginative structure that combines innovative technology of its time to produce a dramatic space full of natural light with the striking focal point of the roof," Culture Minister David Lammy said of the market. The library, built in 1937, was described as a bold example of classical and modernist influences. The buildings were recommended for listed status by English Heritage, which described them as a key example of a type currently under threat. But speaking on Friday, Mr Sheerman said: "It's a disaster. It means we can't have a magnificent new scheme to regenerate the centre of Huddersfield. "We could have had something for the 21st Century, designed by a brilliant new architect, that would have been something to point at." Mr Sheerman questioned why Huddersfield had so many listed buildings. "We have got some dreadful high rise flats on the ring road - I've no doubt they will be next," he added.